Messier 49 (M49) is an elliptical galaxy located in the southern constellation Virgo. The galaxy has an apparent magnitude of 9.4 and lies at a distance of 55.9 million light years from Earth. It has the designation NGC 4472 in the New General Catalogue. Messier 49 can be found 4.1 degrees to the west-southwest of the star Vindemiatrix, Epsilon Virginis, a yellow giant with a visual magnitude of 2.8. Vindemiatrix is the third brightest star in Virgo. The best time of year to observe the galaxy is during the months of March, April and May. 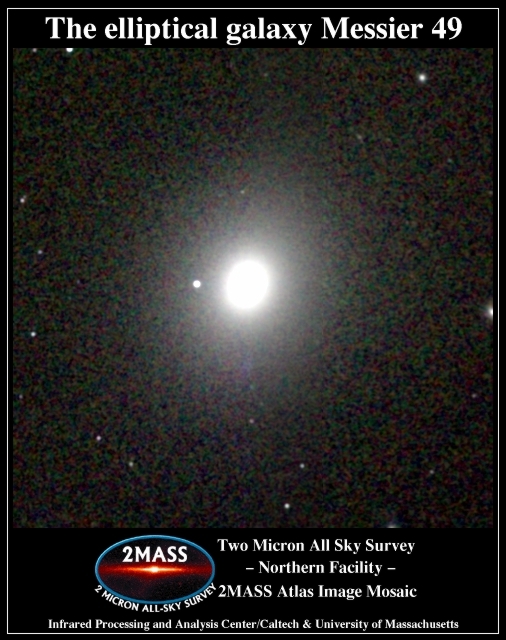 In good conditions, M49 appears as a hazy patch of light in large 15×70 binoculars, while 4-inch telescopes reveal the galaxy’s bright core. 8-inch and larger telescopes show both its bright centre and large halo. However, the galaxy appears mostly featureless and does not get resolved even in larger instruments. Messier 49 is one of the many members of the Virgo Cluster of galaxies. It is located roughly in the area between Vindemiatrix and Denebola, the third brightest star in the neighbouring constellation Leo. 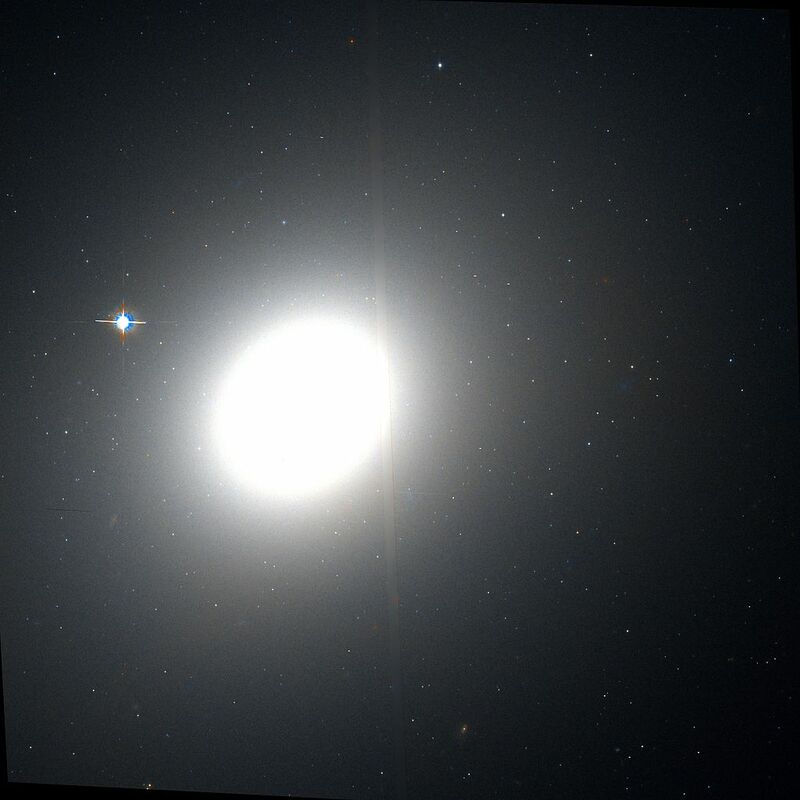 The centre of the Virgo Cluster is positioned halfway along the imaginary line connecting the two stars and M49 can be seen about 5 degrees to the south of the cluster’s centre. Messier 49 was the first member of the Virgo Cluster to be discovered and is the brightest galaxy in this group. The Virgo Cluster is a large cluster of galaxies centred about 54 million light years from Earth. About 157,000 light years across in size, M49 is one of the cluster’s giant elliptical galaxies. It is larger both than the Milky Way (100,000 light years) and the Andromeda Galaxy (140,000 light years). The galaxy contains at least 200 billion stars. It is receding from us at an approximate velocity of 981 km/s. Messier 49 was only the second galaxy discovered outside the Local Group, after Messier 83. M83, also known as the Southern Pinwheel Galaxy, was discovered by the French astronomer Nicolas Louis de Lacaille in 1752. M49 is also more luminous than any of the galaxies lying closer to Earth. Messier 49 belongs to the smaller Virgo B subcluster, a group of galaxies centred on M49. 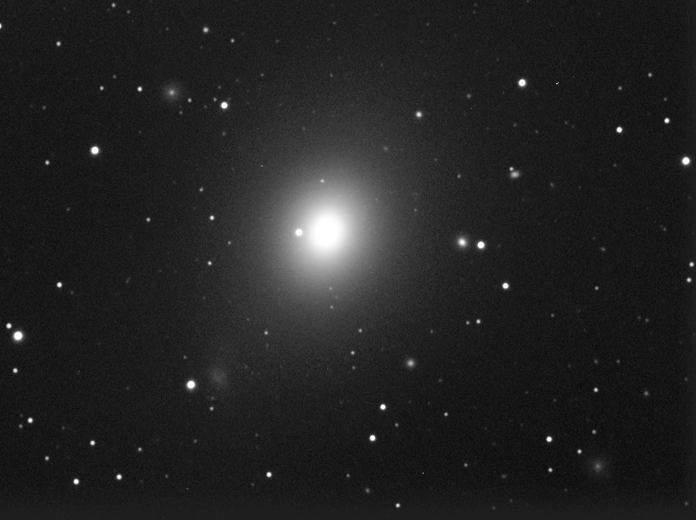 Another major subcluster, Virgo A, is centred on Messier 87, also known as Virgo A. In addition to these two, there are several other subclumps in the Virgo Cluster and they are centred on the galaxies Messier 86, Messier 60 and NGC 4216. 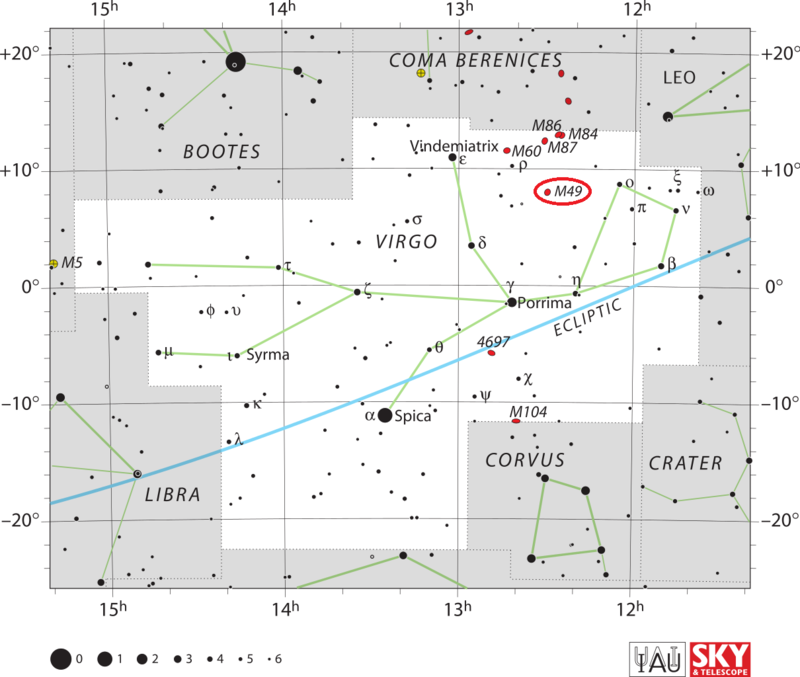 The Virgo B subcluster lies 4.5 degrees away from the dynamic centre of the larger Virgo Cluster. Being an elliptical galaxy, M49 has the physical form of a radio galaxy, an active galaxy that is very luminous at radio wavelengths, but the galaxy’s actual radio emissions are in fact similar to those of a normal galaxy. Messier 49 contains a large number of globular clusters, estimated at 5,900. The globulars detected in M49 have an average age of about 10 billion years. The supergiant elliptical galaxy Messier 87 has an even greater collection of globulars, estimated at 13,450. It lies in the same area of the sky as M49. 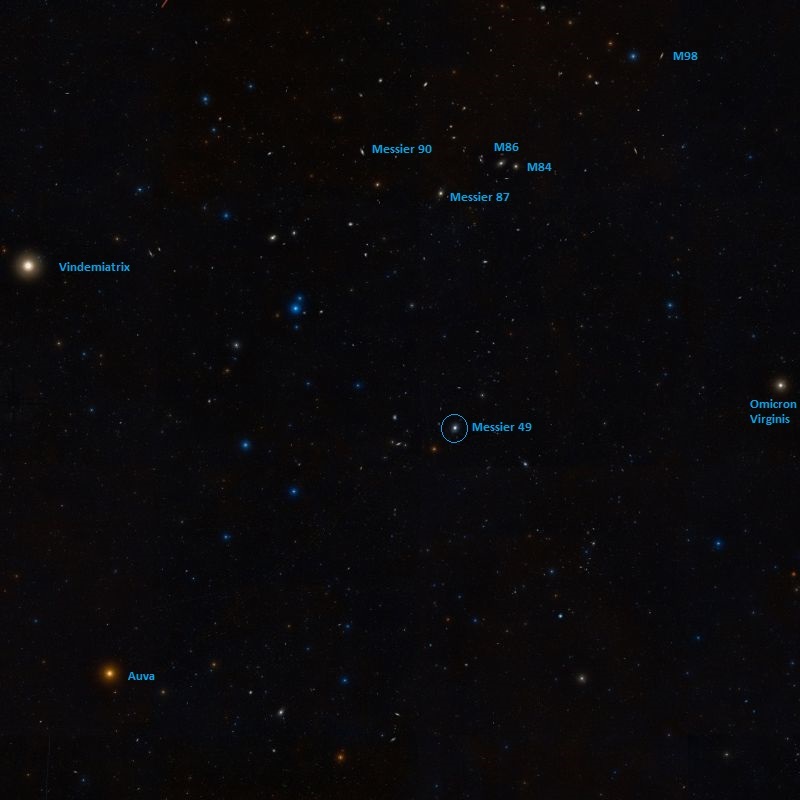 Messier 49 does not show any evidence of recent star formation. The galaxy appears very yellow, which means that the stars in its are mostly older and redder than the Sun. This suggests that the last episode of star formation in M49 took place about 6 billion years ago. The nucleus of Messier 49 is an X-ray source, indicating that the galaxy has a supermassive black hole at its core. The black hole has an estimated mass of 565 million solar masses. Only one supernova has been detected in the galaxy so far. Discovered in June 1969, SN 1969Q reached magnitude 13.0. Messier 49 is interacting with the nearby dwarf irregular galaxy UGC 7636. A trail of debris from the smaller galaxy stretches across an area about 1 by 5 arc minutes in apparent size, corresponding to a spatial dimension of 30 by 6 kiloparsecs. In the period from 2000 to 2009, scientists found strong evidence of a stellar mass black hole in one of the galaxy’s clusters. In 2011, another candidate was discovered. Nebula discovered near the star Rho Virginis. One cannot see it without difficulty with an ordinary telescope of 3.5-feet [FL]. The Comet of 1779 was compared by M. Messier with this nebula on April 22 and 23: The comet and the nebula had the same light. M. Messier has reported this nebula on the chart of the route of the comet, which appeared in the volume of the Academy of the same year 1779. Seen again on April 10, 1781. The object was discovered independently by the Italian astronomer Barnaba Oriani on April 22, 1779. Oriani described the “nebula” as “very pale and looking exactly like the comet [1779 Bode, C/1779 A1].” The discovery of M49 was later erroneously attributed to Oriani by Admiral William Henry Smyth in his 1844 Bedford Catalogue, by John Herschel in his 1864 General Catalogue and by John Louis Emil Dreyer in the New General Catalogue. A bright, round, and well-defined nebula, on the Virgin‘s left shoulder; exactly on the line between Delta Virginis and Beta Leonis, 8deg, or less than half-way, from the former star. With an eyepiece magnifying 93 times, there are only two telescopic stars in the field, one of which is in the sp and the other in the sf quadrant; and the nebula has a very pearly aspect. This object was discovered by Oriani in 1771 [false], and registered by Messier as a “faint nebula, not seen without difficulty,” with a telescope of 3 1/2 feet in length. It is a pity that this active and very assiduous astronomer could not have been furnished with one of the giant telescopes of the present days. Had he possessed efficient means, there can be no doubt of the augmentation of his useful and, in its day, unique Catalogue: a collection of objects for which sidereal astronomy must ever remain indebted to him. Messier 49. Atlas Image obtained as part of the Two Micron All Sky Survey (2MASS), a joint project of the University of Massachusetts and the Infrared Processing and Analysis Center/California Institute of Technology, funded by the National Aeronautics and Space Administration and the National Science Foundation.